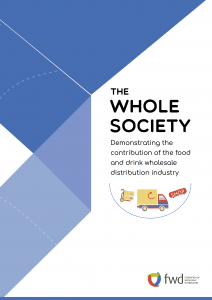 Our new report outlines the economic and societal impact of FWD wholesalers and their customers. Compiled by Capital Economics with the co-operation of FWD members, it’s now available for free distribution. The sector supplies and supports 400,000 businesses in the UK, providing them with advice, expertise and experience as well as the right products to them to grow and create employment in their neighbourhoods. This supply chain preserves vital local services and increases diversity, value and service in the food industry. With depots located in all regions of the UK, FWD members supply fresh, chilled, frozen and ambient food and drinks, and associated products, to 72,000 retail businesses and 362,000 catering or foodservice businesses. The sector’s customers include independent shops, cafes, restaurants, hotels, care homes and pubs, as well as catering outlets in private companies and public institutions such as hospitals, schools, universities and prisons. 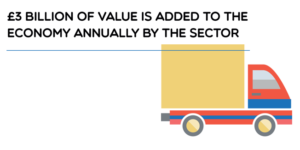 Members of the Federation of Wholesale Distributors operate Symbol or Fascia groups, which combine the buying power of independent shops and set store standards with which group members must comply in return for the wholesaler’s help in merchandising, sourcing new products and business advice. 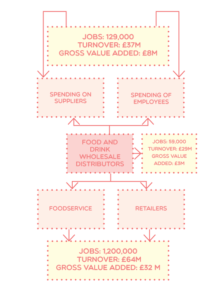 Around 35 per cent of food and drink wholesale distributors’ revenue comes from sales to catering and foodservice providers who supply food and drink to a wide range of organisations including schools, hospitals, social clubs, guest houses, coffee shops and petrol forecourts; this supports 569,000 jobs in the wider economy. 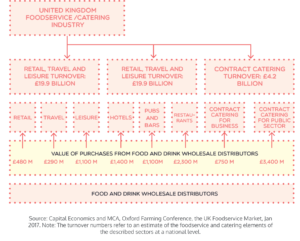 The activities of food and drink wholesale distributors generated £830 million in taxes in 2016. This included £300 million in value added tax, £170 million in employers’ national insurance contributions, £150 million in business rates and £70 million in corporation tax. FWD wholesalers spent £26bn with suppliers, supporting 100,000 upstream jobs, and their employees spent £1.4bn on UK-based businesses.